This is a daunting task. 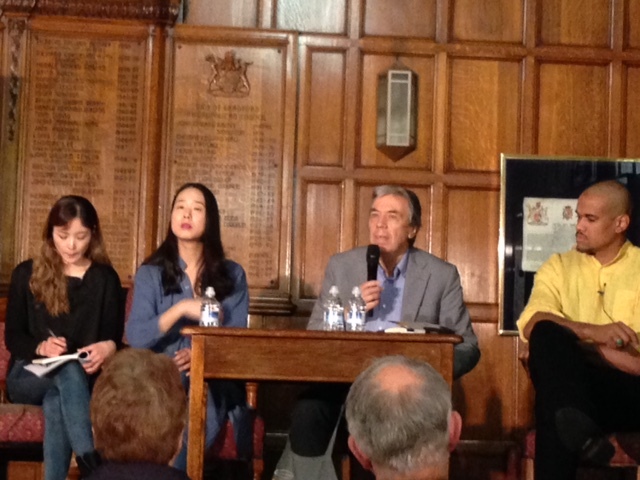 I was only at the Bradford Literature Festival for a day and a half and attended just two sessions in addition to the panel I was on, but I can only hope to share a few fleeting personal impressions of this vibrant and ambitious 10 day event. It’s making a big impact in the literary world and, more importantly, the real world, with a strong increase in visitor numbers in its third year and its success in attracting significant funding from both the public and private sector. This piece by Heloise Wood of The Bookseller gives you all the background I don’t have space for. 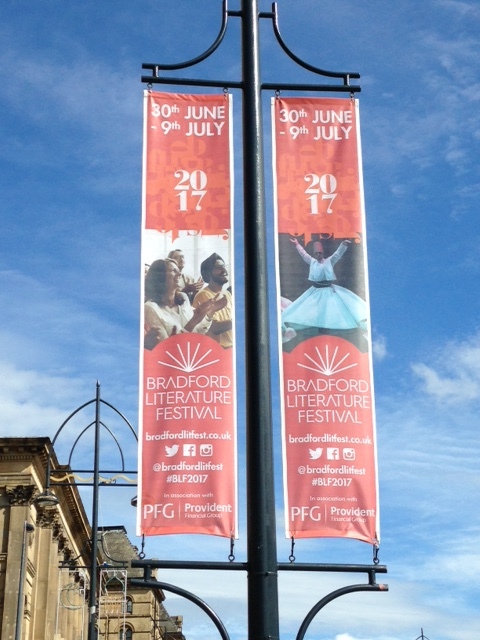 Bradford is renowned as one of the UK’s most multi-cultural cities and this really comes through in an exceptionally broad programme of events with a noticeably fresh slant and hence far wider appeal than many literary festivals – I was kicking myself for not arranging to stay longer (and if it was closer to home, I’d go back). 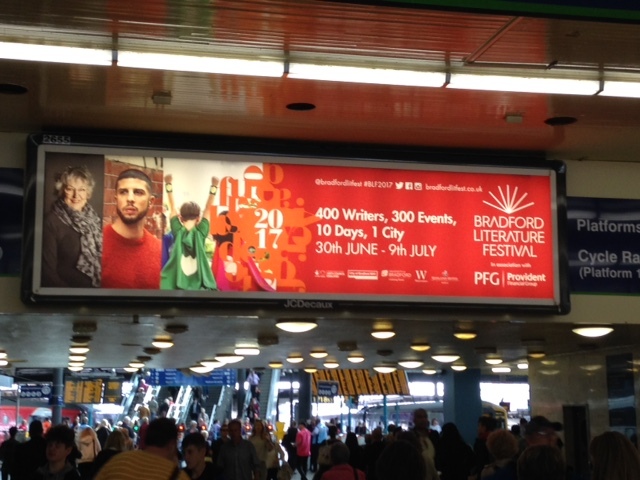 Two things really struck me: with its instinctive diversity, the Bradford Literature Festival offers irrefutable proof of the wealth of BAME talent that exists in the literary world and that people of all backgrounds are interested in those stories. Secondly, this festival sets a superb example with the fairness, respect and warm hospitality it extends to authors, both to big names and newcomers like me. It sounds like a no-brainer to recognise that writers are at the heart of the book world, but it doesn’t always feel that way! It would have been worth the trip north just to hear Boyd Tonkin’s other guest, Johannes Anyuru, whose 2015 A Storm blew in from Paradise, translated by Rachel Willson-Broyles (World Editions), was a bestseller in Sweden. It is closely based on the life story of his father, a Ugandan fighter pilot who was driven into exile under the dictatorship of Idi Amin and met his future wife, Anyuru’s mother, in a refugee camp in Kenya before they settled in her native Sweden. I was initially surprised to hear the author say that questions of immigration, belonging and Swedishness ‘bore him to death’, until I realised how tedious it must be, constantly having to account for yourself in that way. Anyuru ‘writes against that idea’ so it wasn’t a ‘who am I? exercise for him – he felt it was a good story regardless of the fact it was his own father’s (it certainly sounds like one). It had long haunted him and over time he came to see it as more tragic than exciting to have one’s life plans swept away by geo-political upheaval. The responsibility of doing justice to that experience led to several false starts. Poets bring something special to the writing of prose, and I was struck by Anyuru’s deeply felt relationship with language when the discussion turned specifically to the challenges of literary translation. It is a vastly undervalued art, the translator’s name frequently omitted, and I thought Anyuru summed it up very well in saying that something is always lost in translation, but the translator’s task is to shade in the gaps to compensate, which takes confidence and courage. Despite being staggeringly articulate in English, he speaks movingly about the primal emotional connection with Swedish as his mother tongue, the ‘taste’ and ‘emotional charge’ of words familiar since childhood. He credits becoming a writer in the first place to having read British and American poets as a teenager, not in the original, but translated into Swedish, thereby bridging that emotional divide. The discussion which took place on the different facets of emotion and personality which multilingual people can draw on resonated with me on a very personal level; whilst my French is far from perfect, the language has always been a big part of my life and without that influence I wouldn’t be who I am or write as I do. It’s almost the opposite way around for me: there are things I feel and ideas I understand more deeply in French and have to search for the words to express that in English. And as mentioned at the event, English is not one language, every version with its own nuances of tone and meaning. This session deserves a far more detailed write-up, but no doubt you’ve gathered how exciting I found it. The second event I attended was another cracker, on The Politics of Independent Publishing, brilliantly chaired at the last minute by David M Barnett (whose own novel Calling Major Tom was published last week by Orion, see the striking blue and yellow cover in the photo below) with three visionary independent publishers on the panel: Valerie Brandes from Jacaranda, Alessandro Gallenzi from Alma Books and Kevin Duffy from Blue Moose Books, based locally in Hebden Bridge. All three really impressed me with their passion for getting behind books which are brilliant but wouldn’t have the commercial appeal to attract the support of large publishing houses and their willingness to take not just the occasional risk, but a risk with every book they publish. The increasing homogeneity of the mainstream industry concerns me and I can’t say enough how much I admire small publishing houses who put their necks (and sometimes their homes) on the line to bring readers works which feature amongst my most exciting finds year after year (last week’s guest title, Kate Brown’s The Women of Versailles from Welsh publisher Seren is a case in point, and Avril Joy’s Sometimes a River Song from Linen Press was one of my Books of 2016). All three publishers present mentioned their openness to voices we may simply not otherwise hear, from the regions, from Europe and all corners of the world, and to working with authors editorially to achieve the best possible quality, with production values to match. Kevin Duffy’s story about Benjamin Myers’ acclaimed novel Pig Iron being widely rejected in London because there’s allegedly no market for books set in ‘small northern towns’ (we’re talking about Durham, by the way) makes me cringe. I’ve heard dozens of varieties of that response and there are numerous examples which prove how mistaken they are, as well as patronising to all concerned. I’m putting David Barnett’s book and a title from each of these three houses on my TBR right away! Finally to the reason I was at the festival – I was delighted to be on a panel discussing Writing and Thriving in the Digital Age with Nikesh Shukla, author, diversity campaigner and the instigator of crowdfunded sensation The Good Immigrant and Molly Flatt, head of FutureBook and multi-tasking publishing dynamo, chaired by Danuta Kean of The Guardian. These are three people I’ve followed and known of for a long time – it was great to finally meet them and far less strange than it sounds to have our first real-life conversation in front of an audience, on something we all feel passionately about. Not having attempted this before, I’m realising it’s actually quite hard to give an account of an event you were involved in (maybe someone in the audience will oblige?). What I can say is that it was a really enjoyable discussion and the message that seemed to emerge was all about the new opportunities the digital age offers for connection between readers and writers, for mutual support amongst people who value storytelling (as opposed to the divisiveness of, say, ‘print v. digital’ stand-off at a time when reading in all its forms should surely be encouraged regardless of format) and, picking up on themes from the indie publishing event above, the opportunities it offers for a wider variety of written work to make it out there. We had a great audience who asked brilliant questions and it was lovely to hear from some of them afterwards that they left feeling as inspired and motivated as we all did. I’d like to thank the Bradford Literature Festival for inviting me and the staff for their welcome and organisational skills; Waterstones Bradford for selling my novel Paris Mon Amour in the Hub (its first Waterstones appearance and hopefully not the last…) and to all the friendly and inspiring people I met or got to listen to. The good news is that the programme continues for another whole week – if you have the chance, I’d really recommend it and there’s no doubt it’ll be a fixture on my literary calendar from now on. This sounds really fascinating Isabel – going to have to try and go one day! Would have loved to have been there for the The Politics of Independent Publishing event, sounds right up my street. I also loved Sometimes a River Song, such a lovely novel that deserves a wider readership. A really interesting and thoughtful write-up, Isabel. 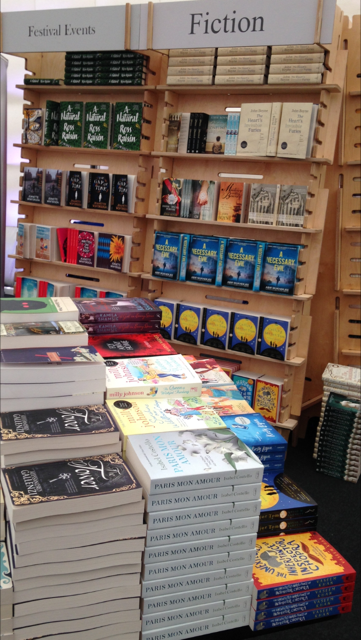 Seems the festival went beyond the trite-ness of stock answers and yawnsome ‘Tips for Writers’. Sounds like you got a lot out of it and you’ve piqued my interest for next year. Thanks! Congratulations on your literary festival appearance (debut? ), Isabel, and great that they / you are championing small presses. I think I’ve read anything from Jacaranda but have just got into reviewing for Alma which is a fabulous little press. I’m prioritising the independents in my reading this year and coming across some fabulous stuff. And Bradford is a great city on the edge of some fantastic countryside. The question of translation offers so many word by word challenges. I’m teaching myself grammatical French by trying to internalize the language, reading public domain novels, and trying them out myself as translator. In one instance, the word poignant was taken by the translating software as “pungent”, where in context the English sense was obviously right, and I think the French use it this way too.